FUNAN is director Denis Do’s tribute to his mother. The film is a fictionalized version of his mother’s life under the Khmer Rouge in Cambodia. It follows events from the arrival of the Khmer in Phnom Penh when they forcibly evacuated the city and drove everyone into internment camps on through her escape and flight to Thailand. Since the Khmer split up children and sent them to a separate camp the story also tells the story of Do’s brother who was thrown into a camp for children. Do’s film is a beautifully animated story. Told with a bright palate the film takes the bold choice to keep the film color the look and feel of the film seems to run counter to how you would tell such a serious and heavy tale. Just because terrible things are happening it doesn’t mean the world is dark. Colors pop. The images are not altered to hint at the evil of the Khmer. Do lets the ugliness of the actions speak. It’s an brilliant choice because if you look at most of the images it looks like a family friendly film. Indeed when I was watching the film for this review my brother walked into the room and saw the animation and asked if this was something for my young niece. No it isn’t. As gorgeous as the film looks the very serious nature of the film means it should be viewed by older kids and teens who will be able to comprehend what happened. 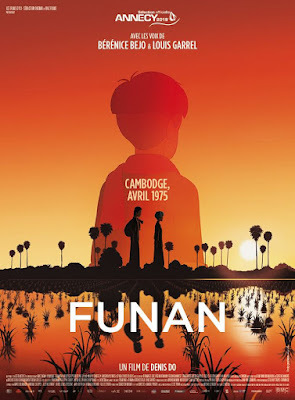 While I can sing the praises of FUNAN up and down on an artistic level or as a must see for anyone who doesn’t know what happened in Cambodia in 1975, I am mixed on the film on a personal level. Chalk my feelings up to being a little too familiar with what happened as well as having seen a few too many films (both narrative and documentary) that tell a similar tale with similar images. While I freely admit there are only so many ways to tell this sort of story I would have hoped the animation didn’t seem to mirror so precisely some earlier films. I apologize to Mr Do and fans of the film but this reaction is mine and mine alone and is the result of being too long in the cinematic trenches. My own issues aside, FUNAN is a must see for those wanting to see beautiful animation and those wanting potentially kicked to the curb by a heartbreaking true story of overcoming one of the last century’s greatest evils. FUNAN was also recently picked up by GKids who will release the film in the spring to theaters.